Plants cespitose, not rhizomatous. Culms 30-75 cm tall, 0.5-1.7 mm thick, internodes pubescent or glabrous, pubescence more common on the lower internodes, particularly just below the nodes; nodes 2-3, lower nodes retrorsely pubescent, upper nodes glabrous or pubescent. Basal sheaths glabrous, usually smooth, brown or gray-brown; collars glabrous, without tufts of hair at the sides; basal ligules 1.5-6 mm, hyaline, rounded to acute, lacerate; upper ligules to 8 mm, hyaline, acute, glabrous; blades 0.5-2 mm wide, convolute, abaxial surfaces scabrous, adaxial surfaces scabrous or hairy, hairs about 0.3 mm. Panicles 7-15 cm long, 0.5-2.5 cm wide, often included in the upper leaf sheaths at the start of anthesis; branches 1.5-6 cm, appressed to strongly ascending, with 1-6 spikelets. 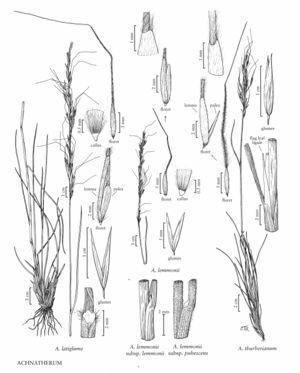 Glumes often purplish; lower glumes 10-15 mm long, 1.2-2 mm wide; upper glumes to 2 mm shorter; florets 6-9 mm long, 0.7-1.2 mm thick, fusiform, terete; calluses 0.9-1.5 mm, sharp; lemmas coriaceous, evenly pubescent or the back glabrate distally, hairs 0.5-0.8 mm, apices lobed on 1 margin, lobe about 0.1 mm long, thick, apical lemma hairs 0.5-0.8 mm; awns 32-56 mm, twice-geniculate, first 2 segments pilose, hairs 0.8-2 mm, terminal segment glabrous, often scabrous; paleas 4.6-6.1 mm, 3/4 - 9/10 as long as the lemmas, sparsely pubescent towards the base; anthers 2.5-3.5 mm, dehiscent, not penicillate. Caryopses 5-7 mm, fusiform. 2n =34. Wash., Utah, Calif., Colo., Oreg., Mont., Wyo., Idaho, Nev.